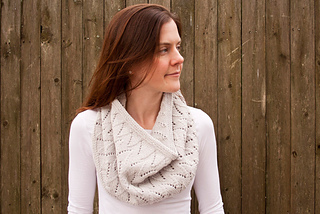 My Jane Cowl Grand Loop may be worn as a single loop or shoulder wrap, doubling the fun and seasonal usage. 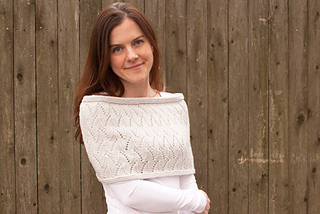 It works beautifully as an under jacket neckline filler. Then once you’ve arrived at your destination, or when warmer days permit, slip it gently around your shoulders for special style. 11 by 37 (45.75, 53) inch loop tapering at upper edge to 32 (39.25, 45.5) inches, after blocking. 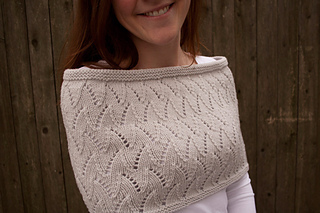 Shown in Lark wool by Quince & Co. (100% wool; 134 yds (123 m) per 50g skein); color – Frost #103; 4 (5, 5) skeins, or for comparable yarn, approximately 465 (575, 675) yards. Techniques: knit, purl, Long-tail cast on, working in the round, garter stitch, k2tog, yo, and ssk.